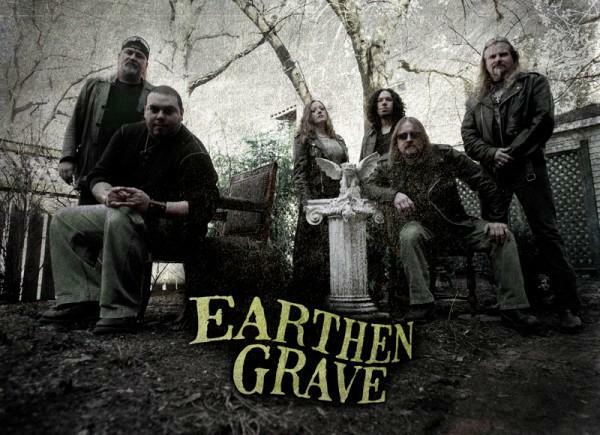 With Mark Weiner on vocals, Ron Holzner on bass, Jason Muxlow and Tony Spillman on guitar, Scott Davidson on drums, and Rachel Barton Pine on an extended-range electric violin, Earthen Grave boasts an undeniable collective metal and musical pedigree. Ron was a member of the seminal and seismic doom pioneers Trouble, with whom he played for over fifteen years. Jason is a gifted guitarist and composer who has lived the music, both as a member of the well-respected band The Living Fields and as the founder of Deadtide.com. Scott’s dedication has manifested as a drummer in numerous metal bands, booking shows and running radio station Rebel Radio. Tony has been in and around the metal scene for many years, and has worked with such bands as Trouble, Prong and Ministry. Mark has performed and recorded with several bands including Trifog. And while Rachel has never been in a metal band per se, her status as an internationally acclaimed classical violin soloist has taken her all over the world as both performer and music ambassador. While on tour for classical performances, Rachel often visits rock radio stations to perform metal songs and discuss the music’s intensity and compositional complexity. This entry was posted on April 20, 2009 at 11:26 pm and is filed under doom metal, Interviews with tags DOOM, Earthen Grave, rachel barton pine, ron holzner, The Living Fields, Trouble. You can follow any responses to this entry through the RSS 2.0 feed. You can leave a response, or trackback from your own site.